Produced by Elope in 2014, this is a laplander beanie hat in the image of Bumblebee as seen on the long running animated and live action movie series The Transformers. It is knitted acrylic and is a new and unused hat stored in a smoke and pet free environment. 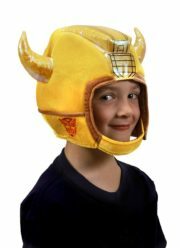 Produced by Elope in 2014, this is a plush helmet hat in the image of Bumblebee in his fighting form as seen on the long running animated and live action movie series The Transformers. Suitable for both children and adults, it is knitted acrylic. 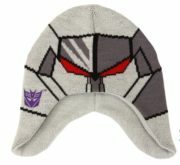 Produced by Elope in 2014, this is a lap-lander beanie hat in the image of Megatron as seen on the long running animated and live action movie series The Transformers. It is knitted acrylic and is a new and unused hat stored in a smoke and pet free environment. 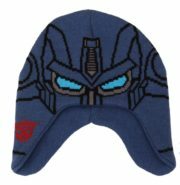 Produced by Elope in 2014, this is a laplander beanie hat in the image of Optimus Prime as seen on the long running animated and live action movie series The Transformers. It is knitted acrylic and is a new and unused hat stored in a smoke and pet free environment. 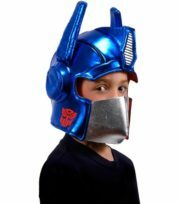 Get ready to transform from a semi-truck to an Autobot with this blue plush helmet hat with silver face mask cover in the image of Optimus Prime in his fighting form as seen on the animated and live action movie series The Transformers. Standard One Size fits most so anyone can look like Optimus Prime. Wear this mask with an Optimus Prime costume (or normal clothes) for a Transformer look everyone will love. 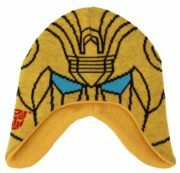 It is a new, unused, 100 % polyester hat with soft horns and the Autobots logo. 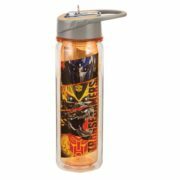 This is a clear 18 ounce double wall Eastman Tritan water bottle featuring the comic art image of Transformers 4 movie heroes. It Resists Condensation, has a spill proof sport lid with a straw and is BPA Free. 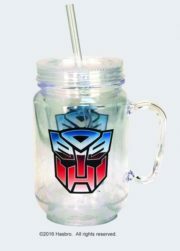 This is an illustrated, 12 ounce, clear, double wall, acrylic mini mason jar featuring the animated image of the Autobots logo from the Transformers TV series.. 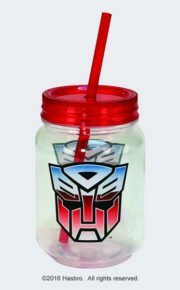 This is an illustrated, 16 ounce, clear, double wall, acrylic mason jar featuring the animated image of the Autobots logo from the Transformers TV series.. 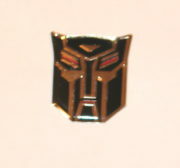 This is a 1 5/16″ high enamel metal pin, featuring the black and silver face logo of Autobot from the TV series and new movie Transformers. It is a new, unused pin. 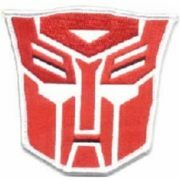 This is a 3 1/2″ wide embroidered patch, featuring the logo of the Autobots from the TV series and new Transformers movies. This is a cloth baseball style hat with a mesh back with the Transformers Autobot logo patch attached to the front. This is a new, never worn hat, available in either blue or black. If you do not choose we will send our choice. 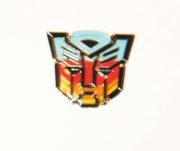 This is a 1.25″ high enamel metal pin, featuring the multi-color face logo of Autobot from the TV series and new movie Transformers. 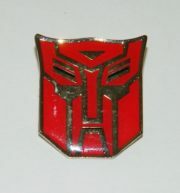 This is a 1 5/16″ high enamel metal pin, featuring the red and silver face logo of Autobot from the TV series and new movie Transformers. This is a new and unused light clear, twist open, 24 oz. 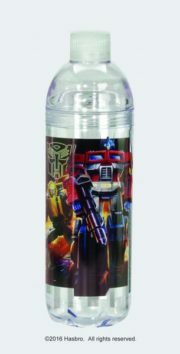 acrylic water bottle featuring a collage of images of the Autobots from the Transformers animated series. 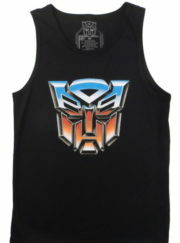 This is a black tank top shirt with the symbol of the Autobots shield logo from the Transformers on the front. It is a 100% cotton, pre-shrunk design, and is a new, never worn shirt, available from us in size 2X only for this listing. It has been stored in a smoke and pet free environment. 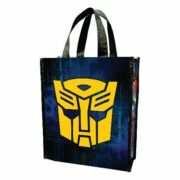 Featuring the animated image of the Transforms Autobots symbol and the Transformers movie logo as seen in the Transformers movies and merchandise, this is a small recycled tote that is earth-friendly (made of 25% recycled materials), strong and water resistant. Great for shopping and a good alternative to a traditional gift bag. 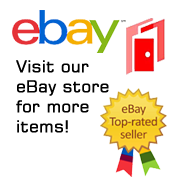 It measures 10″ x 4.5″ x 12″ with a strap that features a 6 1/2″ drop. You can wipe clean with a damp cloth. This is a new, unused tote. This amazingly detailed model starts as 4″ square sheets and finishes as a 3-D model. 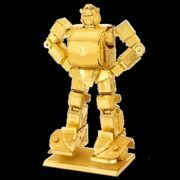 It is approximately 2.75″ tall when assembled and this one features Bumblebee from the popular cartoon, movie and comic series. This is the deluxe gold edition. The sheets contain detailed laser etching for easy removal. This amazingly detailed model starts as 4″ square sheets and finishes as a 3-D model. It is approximately 2.75″ tall when assembled and this one features Bumblebee from the popular cartoon, movie and comic series. The sheets contain detailed laser etching for easy removal. This amazingly detailed model starts as a 4″ square sheet and finishes as a 3-D Caricature model. It is approximately 2.75″ tall when assembled and this one features Bumblebee from the popular cartoon, movie and comic series. The sheet contains detailed laser etching for easy removal. Complete instructions are included to show you how to pop out the pieces, bend the tabs, and connect them at the attachment points with an average assembly time of 30-45 minutes. It has been stored in a smoke and pet free environment. We also offer an optional LED base or a Solar Spinner for better display of your model. 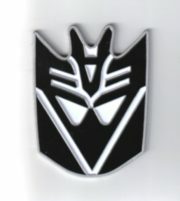 This is a 2.75″ high enamel metal badge, featuring the black and silver face logo of Decepticon from the TV series and new movie Transformers. It has a peal off tab leaving a sticky back so this can be applied to any smooth surface. This is a 3 1/2″ high embroidered patch, featuring the logo of Decepticon from the TV series and movies Transformers. 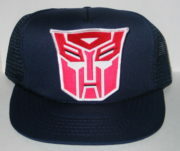 This is a cloth baseball style hat with a mesh back with the Transformers Decepticon logo patch attached to the front. This is a new, never worn hat, available in either blue or black. If you do not choose we will send our choice. 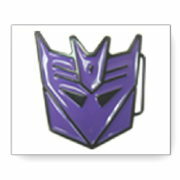 Produced in 2009, this is a 3 3/4″ high large, heavy belt buckle featuring the face of Decepticon in 3-D relief. Cast in a black metal zinc alloy in relief and colored in enamel, this is a new, unused buckle with durable finish that fits standard adjustable belts up to 1 1/2″ wide. 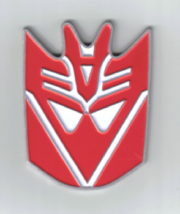 This is a 2.75″ high enamel metal badge, featuring the red and silver face logo of Decepticon from the TV series and new movie Transformers. It has a peal off tab leaving a sticky back so this can be applied to any smooth surface.